"We never had set out to make a traditional campaign." The Call of Duty: Black Ops 4 reveal event confirmed, as rumored, that the game will not have a "conventional campaign", but will instead feature a large-scale battle royale mode, Blackout, complete with land, sea, and air vehicles from the previous games. 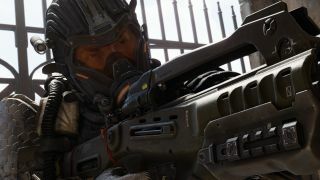 In an interview with Eurogamer, Treyarch's co-studio head Dan Bunting responded to fan feedback, and confirmed that a "traditional campaign" had never been planned for the latest Black Ops title. He also detailed what activities were going to be available to players who still want to play alone. "We never had set out to make a traditional campaign. We always started from the place of we're going to make something different with this game that was going to be inspired by how our community was interacting with Black Ops 3 and the games over the years," Bunting said. "We see more and more players spending more time with multiplayer and zombies, not just in the game, but out of the game, streaming and talking about it in forums. It's generated a really huge crowd response. The decision was, we wanted to make a different style of game this time. "There was never a traditional campaign. We've always wanted to tell stories in different ways. We've always wanted to celebrate our community, especially how you play the game with friends. The heart and soul of this game is how you play games with friends and we wanted to do more with that than we've ever done before." When asked what message he had for fans who had stated that without a single-player campaign they'd boycott the title, Bunting said: "I think change is always going to be hard for people. I would say to our fans, Treyarch has never let you down over the years. This is a studio you know is always going to deliver the best of the experiences you know and love, especially with the Black Ops series. We are delivering so much more of what players spend most of their time doing in our games in the series." Bunting also confirmed that whilst still technically multiplayer, Black Ops 4 will offer "a series" of solo missions that "take you deeper into understanding each of the specialists you're going to play in multiplayer". "It's going to give you backstory," added Bunting. "It's going to give you some worldbuilding setup of, why do these characters exist? Who do they work for? What kind of operations do they run on? Just giving players a sense of connectedness to the world they're engaging in for so long, and tell the stories of those characters we just barely touched on in Black Ops 3, and introduce some new ones in the process as well. That series of missions will also help you refine your skillset with each of those characters, so you can go into multiplayer and feel a sense of mastery." For the full interview, head on over to Eurogamer.